Here at SLM Toyota Uckfield we are pleased to welcome Maddie Wright to the team as a Sales Executive. Maddie has only been working with us for three weeks but is already becoming a valued member of the team. She is new to the industry, however before this worked in an Estate Agency for 2 years, so is used to dealing with customers on a day to day basis. 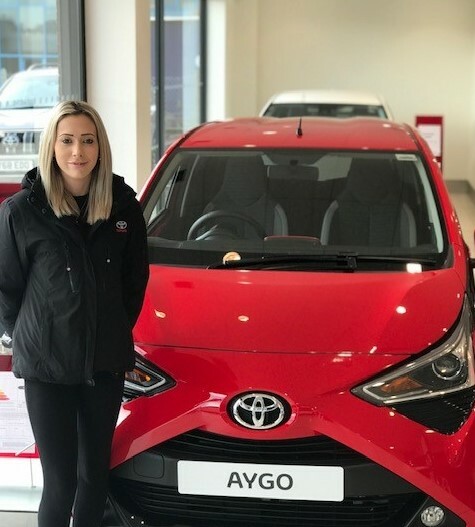 Speaking about why she decided to apply to work at SLM Toyota Uckfield, she commented "the main thing that attracted me to work for Toyota SLM Uckfield is the reliability of the brand and how well known it is. Also how established hybrid is within the company." The most rewarding part of her job is the "customer satisfaction when they realise they have found their dream car." Her favourite car in the range is the stylish Toyota C-HR. In 2019, she is looking forward to "the new Toyota Corolla and the All New RAV4 design and becoming hopefully an established Sales Executive." Maddie's first car was a Mini Cooper and outside of work she enjoys spending quality time with her partner, family and friends. Everyone at SLM would like to welcome Maddie to the team - we all look forward to working with her into the future!